Lions, tigers and Tippi Hedren, oh my! Some of you may have heard of this film, but many others probably not. Roar is a one-of-a-kind film made by producer Noel Marshall who both stars in and directs this film featuring many of the actual lions (and tigers) owned by Marshall and real-life wife, actress Tippi Hedren. "For six years, Hedren and her daughter—the emerging young actress, Melanie Griffith—along with Marshall and his three sons lived, slept and ate with a growing pride of lions inside their home." (Read more on the story here.) It was originally released in 1982, but didn't earn that much, so Drafthouse Films has decided to re-release it in 2015 and here's their trailer for it. It kind of looks awesome. The quotes in this really sell it, just about how dangerous and unbelievable it looks, but I still can't wait to see it. A must see! More from Drafthouse, follow on Twitter+Facebook. "Roaring Back Into Theaters April 17th" - I'm so there. "An unprecedented––and wholly unpredictable––action-adventure, Roar follows wildlife preservationist Hank (The Exorcist producer Noel Marshall in his sole and career-derailing turn as an actor and director), who lives harmoniously alongside a menagerie of untamed animals, including cheetahs, elephants, lions and tigers on a preservation in the African plains. When his wife and children arrive (real-life wife Tippi Hedren, and step-daughter Melanie Griffith) for a visit, a long-brewing battle for dominance between two lions erupts and threatens their very lives." The film was in production for 11 years, cost $17 million to make, and made only $2 million worldwide in its original 1982 release. You can read more on the story behind the production + the injuries here. 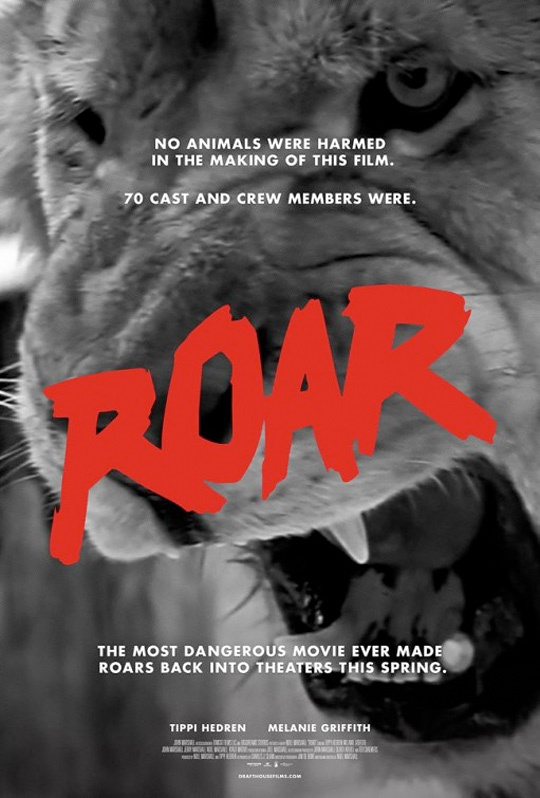 Drafthouse will re-release Roar in theaters starting April 17th. I wonder why they're re-releasing this now. Perhaps because animal activism is becoming mainstream, and we're starting to question the morality of zoos and circuses? The voice over guy has a very blase delivery of "ROAR! ".